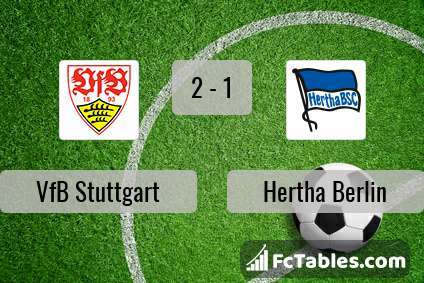 The match VfB Stuttgart-Hertha Berlin 1. Bundesliga will start today 14:30. Referee in the match will be Sascha Stegemann. Team VfB Stuttgart currently is on lower place in table (15 position). Form team looks like this: In the last 5 matches (league + cup) gain 6 points. To defend Hertha Berlin the most demanding players will be Mario Gomez 3 goals, Anastasios Donis 2 goals, Emiliano Insua 1 goals, because this season they scored the most goals for VfB Stuttgart of the entire composition. Most goals developed: Mario Gomez 1 assists, Emiliano Insua 1 assists. Injuries in the team VfB Stuttgart: Dennis Aogo, Pablo Maffeo, Benjamin Pavard, Alexander Meyer, Holger Badstuber, Berkay Ozcan. The match will not occur Erik Thommy because they are suspended (cards, etc.). Team Hertha Berlin is located in the middle of the table. (6 place). In 5 last games (league + cup) Hertha Berlin get 7 points. Not lost the match from 3 games. In this season games 1. Bundesliga the most goals scored players: Vedad Ibisevic 6 goals, Ondrej Duda 6 goals, Valentino Lazaro 2 goals. They will have to be well guarded by defense VfB Stuttgart. Most assists in the club have: Vedad Ibisevic 1 assists, Valentino Lazaro 3 assists. Injured players Hertha Berlin: Karim Rekik, Niklas Stark, Salomon Kalou, Lukas Kluenter, Marko Grujic, Javairo Dilrosun, Florian Baak, Julius Kade, Derrick Luckassen, Marius Gersbeck. Direct matches: usually ended with winning of Hertha Berlin. 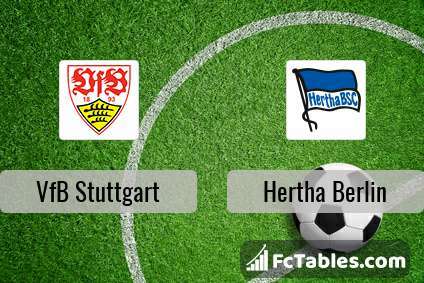 Balace of both teams games are: 10 won VfB Stuttgart, 13 wins Hertha Berlin, 11 draws. In 10 matches the sum of the goals both teams was greater than 2.5 (Over 2.5). On the other hand, 20 matches teams scored more than 1.5 goals (Over 1.5). In 12 matches the both teams have shot at least one goal.